Recently i have been obsessed with EcoTools make up brushes, the finish they seem to give is amazing. i bought the Domed Bronzer Brush a while back and i absolutely loved it, so i bought a few more online and i got them cheaper than i would get them here. this was around £13 i think and from from Boots. I use this for applying bronzer all around the sides of my face and also to blend out in bronzer or concealer used to contour the cheekbones. i am really impressed with this, as it’s quite a stiff brush. i was convinced it was going to apply the bronzer in a big blob but it applies even and really easily. i once tried to use this for foundation, and it was a huge NO NO, the liquid went on my face in big blotches rather than evenly! this is one of my newer brushes, which i love! this was $5.82 which was around £4.00. i can’t see it on the Boots website, so i don’t know how much the retail price would be. i use this with Hoola around the sides of my face – and i know i just said this about the Bronzer Brush – and to contour my cheeks. i also like to apply a highlighter on my cheekbones and the center of my face. this brush is not on Boots.com but i paid $5.75 for it, which is around £3.90, thats amazing for a make up brush this good! this is beyond my new complete absolute favourite shiny amazing brush!! i’ve been using to apply my foundation/tinter moisturiser/BB cream. i can’t actually believe how perfect the finish is on it. i’ve been using it with my Estee Lauder Double Wear, Bobbi Brown Tinted Moisturiser and No7 BB Cream. So here you can see i’ve been using it with three completely different types of product, and they all have different consistences, coverage, purposes etc. I pour some of the product to my hand then lift it up with the brush and apply it to my face, using swirling motions, buffing it or slightly stippling it on. i am 100% satisfied with this brush, and would recommend this to strangers on the street. i wasnt really sold with this brush until around now to be honest, the only thing is that you need to be careful that you don’t pick up too much product. i merely dab the brush into a concealer before using it on my face. i also find it works best with a concealer wand applicator. i use my Estee Lauder Double Wear concealer and i apply it under my eyes, then i use my brush in light, circular motions. Lighter around the eyes, as this is the most sensitive area. this contained 5 brushes and a travel bag for them, but i ditched the bag ’cause i wouldnt use it really. the brushes are travel size, so i wasnt sure what i really thought of them, i like 2, maybe 3 out of the 5 i got. large eyeshadow brush – the website says “the large eye brush to blend a base shadow over the entire eyelid.” i use this brush to set concealer under my eye with a setting powder or a MAC MSF powder, which works so i don’t actually know how effective this is at applying eyeshadow. angled crease brush – this “adds definition to the outer crease of your eye”, i use my no7 Crease/Blending brush to add the crease colour and then i use this brush to go back in with the final darkest colour to really make the crease stand out. Looking at the brush i thought it was too big, and looked like it was make a mess, but it’s really good and a handy brush! petite eye shading brush – this “s perfect for an accent color.” i like this brush for applying the highlight colour in the inner corner. If i’m doing a really dramatic cut crease look, i use this brush or other small brushes to do the crease as it needs to be more defined to achieve that look. highlighting brush – this is used to “accentuate the brow bone and inner corners of the eye”. this isnt used for either of these things. i use this to blend colours in the crease and outer corners. i couldnt even imagine applying anything into the inner corners with this thing! it’s a really big brush for that. smudge brush – this is for “mudging the shadow and liner along the lash line for a smoky finish” it’s probably my favourite in this pack actually! it does EXACTLY what it says and i use it for EXACTLY what i’m supposed to! the brush is stuff enough to manipulate eyeliner and shadows to achieve the perfect smokey eye! this blog seems horrifically rambly, but i had to share it with. 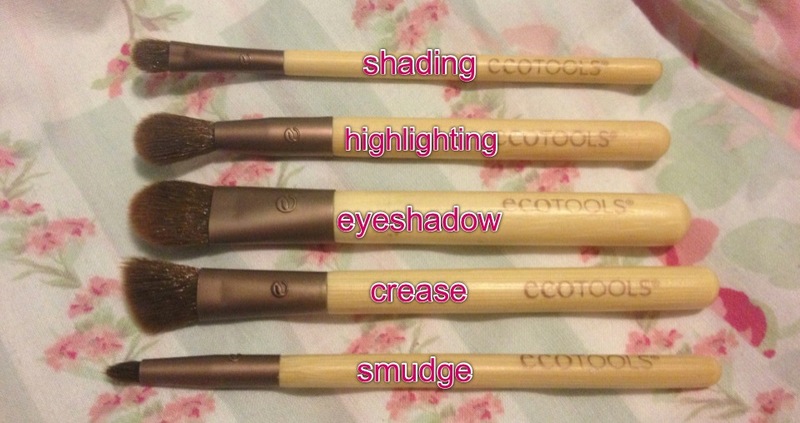 i am in love with ecotools and everytime i’m in boots i always just standing in the aisles just staring at them. i would definitely recommend this brand of brushes to anyone and everyone. they are amazing, and not too pricey!! especially if you get them on ebay! or anywhere else.